After a long, cold winter, Niagara Falls had built up a large ice pack around the falls and on the talus rocks at the bottom. Last summer, I photographed the Bridal Veil Falls as people in yellow raincoats walked on the Hurricane Decks. Last Sunday, the same area had ice packs from ten to thirty feet thick. Bridal Veil Falls from the Canadian city of Niagara Falls. Photos taken eight months apart. Here are some facts about Bridal Veil Falls: Bridal Veil is similar in appearance to the American Falls, starting with a vertical fall of 78 feet (24 m), followed by the water violently descending the talus boulders to the Maid of the Mist Pool 103 feet (31 m) below. The total vertical drop is 181 feet (55 m). The crest elevation of the Falls is 508 feet (155 m). American Falls were flowing freely with a large ice pack in the middle covering the larger boulders you can see in the summer photo at the top. 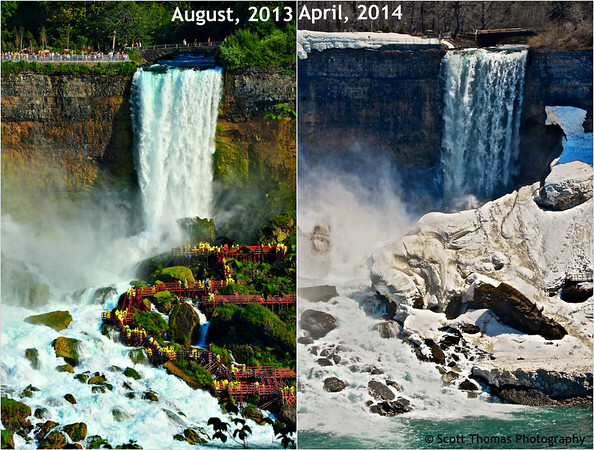 Summer and Spring photos of the American Falls from the Canadian city of Niagara Falls. Photos taken eight months apart. Photography has always been a way to look back in time. Whether the time frame is years, months, days, hours or seconds. One of the main reasons why photography will always be important. This entry was posted in Nature, Travel and tagged 24-120mm, american falls, blue, bridal veil, canada, clouds, hurricane deck, ice, niagara falls, nikon D700, ontario, pack, rocks, sky, spring, summer, tourists, vr, water, waterfall. Bookmark the permalink. Thank you for this juxtaposition, Scott. Three cheers for the Falls and the essence of comparative photography. Comparative photos are such an easy lesson in History for visual learners. Our planet is certainly changing. All the more reason to document it in photos. Love those falls. First saw them as a child, then later on my honeymoon almost three decades ago. We took photos back then. I wonder how much they’ve changed since. 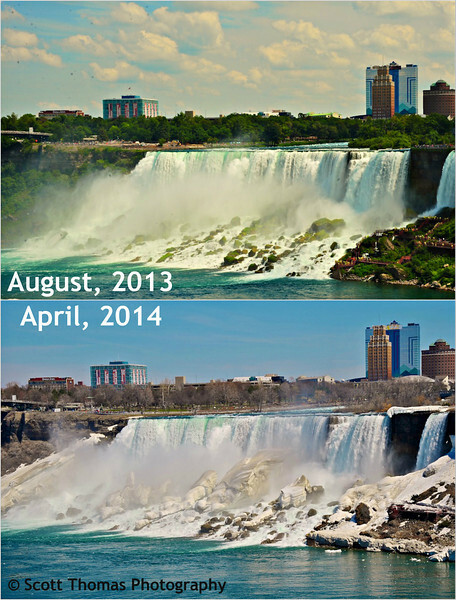 What impresses me most about the comparative images is that Niagara’s power is there in spite of the hard, hard winter just passing. It is not your ordinary everyday waterfall, no indeed.